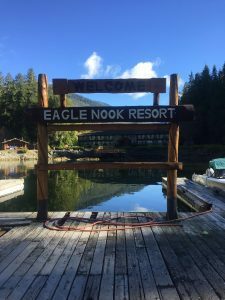 It’s not hard to get excited about spending a summer working at Eagle Nook when you get to see what a magical place it is. A few weeks ago, I was lucky enough to go up there for the first time and we were lucky enough to have the weather cooperate for us and have a couple gorgeous days. After the short drive to Port Alberni, we arrived at the marina where the sun was shining down on us. Standing on the edge of the dock at China Creek, looking out onto the open ocean, I couldn’t wait to get out there. Once we got out on the water and started the ride to the resort, the beauty of our surroundings took my breath away. 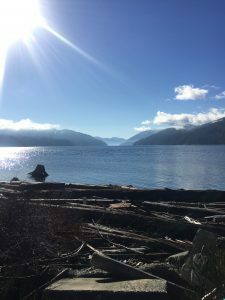 With eagles soaring over head and the occasional seal and otter making an appearance, it made the ride even more magical. Even though I grew up on the island, I sometimes forget, just how beautiful it is and wonder what it must be like for someone coming here for the first time. Pulling up to the resort, it wasn’t hard to see what made it a destination for guests year after year. 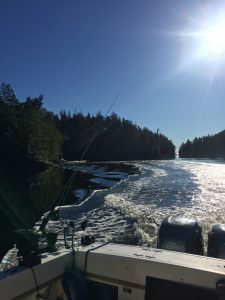 The beautiful landscape and pristine waters, full of salmon and halibut ready to be fished, makes you feel relaxed and at home. With not another building in sight and the calmness up there creates the perfect backdrop for an ideal escape from the hustle and bustle of the city. With the picturesque views from the dining room, patios and beautiful ocean views from each room, I couldn’t help but fall in love with the place, which was fitting considering it was Valentine’s Day. 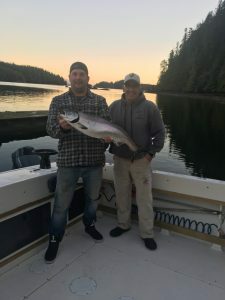 Living on the West Coast, we have some advantages, like being able to go out Salmon fishing in February. So of course, when we had the opportunity to go out, we took full advantage. People always ask when the best time to come is, and the reality is, anytime is good. Even in the middle of February, we managed to reel in a beautiful twelve pound winter spring salmon. With some of August already being sold out, it’s shaping up to be a busy season!! 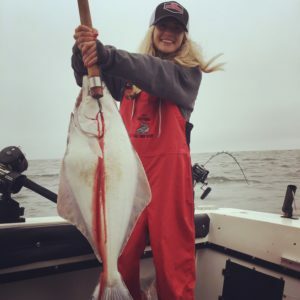 So if you’re thinking of a halibut or salmon trip this summer, give us a call or send us an e-mail! We’re available 7 days a week at (250) 880 0636 or info@eaglenook.com. We look forward to seeing you this summer. 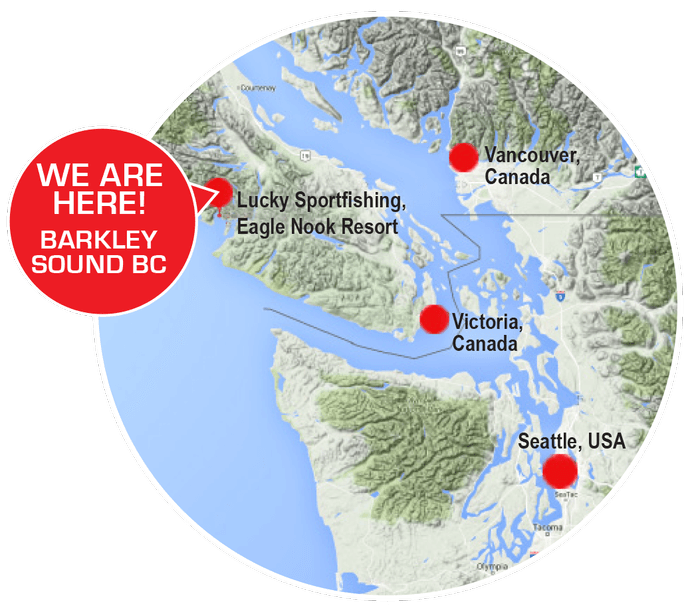 The Victoria Boat & Fishing Show took place this past weekend and Eagle Nook Resort & Lucky Sportfishing had a booth set up for our second year at the show. 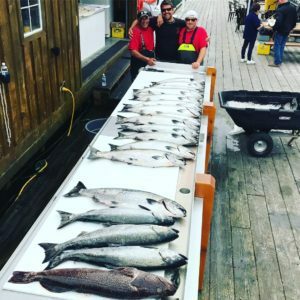 Although it’s a smaller event than some of the other shows we attend in the pre-season, it’s an awesome opportunity for us to meet local fishermen (and women) and stay involved with the Victoria fishing community. Another great event that takes place the same weekend every year is the Pacific Salmon Foundation Dinner & Gala, hosted at The Fairmont Empress in downtown Victoria. 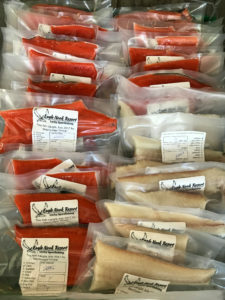 The dinner and auction support salmon conservation and rehabilitation projects throughout British Columbia and the Yukon, and it’s a guaranteed good time for all who attend. 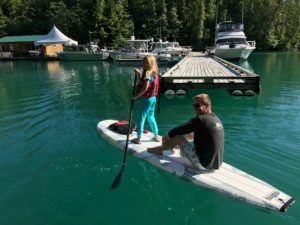 At last year’s dinner Eagle Nook picked up an inflatable paddleboard from the auction which was put to good use by our guests at the resort last summer. We had a large group of past and present members of our team join us at the dinner and it was great not only to catch up with old friends, but also to see so many people out in support of the Foundation and their many projects on the west coast. We’re already looking forward to 2018!